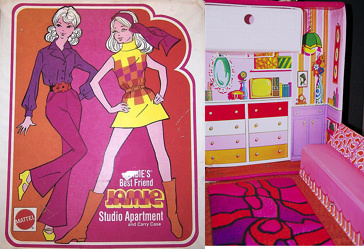 Walking Jamie Doll was a Sears Exclusive Barbie Doll sold from 1970 to 1972. 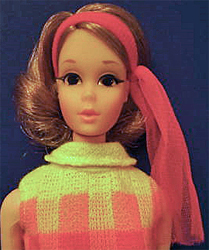 She was also available in two different gift sets - Furry Friends in 1970 & 1971 and Strollin in Style in 1972. 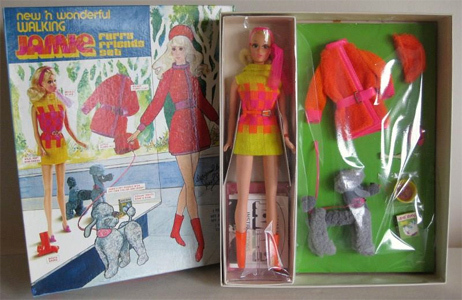 Walking Jamie Furry Friends Gift Set was a Sears Exclusive sold in 1970 and 1971. The price in the 1970 Wishbook was $8.99 and in 1971 it was featured with a $1 price cut, at $7.99. The Gift Set included a Walking Jamie doll in her original outfit (described above) along with an orange fuzzy coat and hat with hot pink vinyl trim and pilgrim shoes, a grey poodle, leash, bone and a yellow dog food bowl and dog food box. These are the same items included in Dog ‘N Duds #1613 (1964-1965). 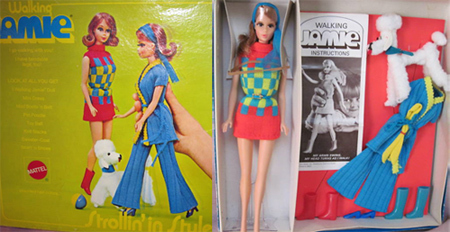 Walking Jamie Strollin in Style Gift Set was a 1972 Sears Exclusive. 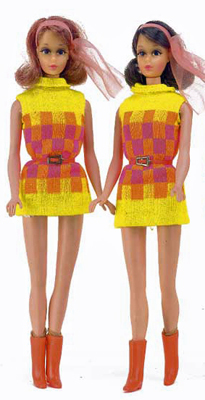 It included a Walking Jamie Doll wearing a variation of her original outfit (described above) - The dress is blue, yellow and red with red boots and a blue scarf. The set also includes a blue knit pantsuit with yellow trim. It has a crocheted blue belt and blue pilgrim shoes. She has a white poodle with a blue collar and a blue and yellow ball. There were two different cases for Jamie - both are very hard to find. 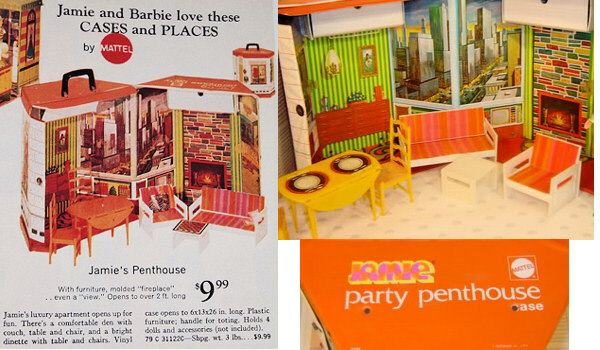 The deluxe version was Jamie's Party Penthouse - a trunk size case that was in the 1971 Sears catalog with a $9.99 price tag. It came with furniture and had a molded fireplace. It opens up to over two feet. It is a six-sided case. The furniture included was a sofa, table & chair, a dinette table & chairs. 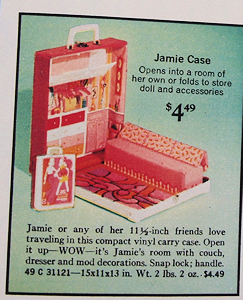 Jamie's Studio Apartment Case is a single case that was offered in the 1971 Sears Catalog for $4.99. It has a molded sofa and mod room decor on the inside.